At Senior Sorters we know that liquidating your estate or that of a loved one is a challenging task. Often such efforts occur at a time when people are emotionally stressed and over burdened. Senior Sorters are very sensitive to this and put your needs first and foremost. Senior Sorters & Estate Liquidators, LLC is one of the Bay area's busiest & most sought after estate sale companies. The only estate sale company with a GIA Graduate Gemologist and an A.I.A. certified antique appraiser on staff. Hazel Kravariotis & Katherine Fogelman are both Accredited Estate Liquidators or AEL. At Senior Sorters and Estate Liquidators, LLC we have a permanent full time team of knowledgeable and seasoned professionals and Katherine is a Graduate Gemologist. We specialize in jewelry both fine and costume. We work with families, realtors and attorneys as each job dictates. We have a large e-mail following to bring in buyers and we are respected in the industry as being friendly, professional, competent and fast. Our merchandising expertise will bring you the maximum dollar return. Let our company quickly turn your family’s estate into cash for you and your loved ones. You would be amazed at what we can sell so don't throw anything away. We do all the work to run a professional estate sale and take away your stress and worry. We will leave you a cleared estate ready to market and sell. Why choose us? Quite simply...we care and we are the best in our field! 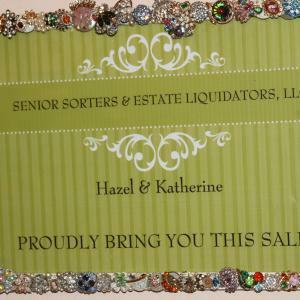 SENIOR SORTERS FUN IN MARTINEZ ESTATE SALE...Saturday & Sunday! Senior Sorters Fabulous Vallejo Estate...Not to be Missed! SENIOR SORTERS OUTSTANDING DANVILLE ESTATE..Jewelry Heaven! SENIOR SORTERS MARTINEZ ESTATE...Antique Extravaganza! SENIOR SORTERS AMAZING MARTINEZ ESTATE...PART 2! SENIOR SORTERS FANTASTIC MARTINEZ ESTATE...Mark your Calendars! SENIOR SORTERS MORAGA ESTATE..Substantial Jewelry Collection, Ladies Fashion and Much More! SENIOR SORTERS WALNUT CREEK ESTATE..Mid Century Art, Native American Collectibles & Fine Jewelry. SENIOR SORTERS FUNKY, FUN & FABULOUS LAFAYETTE ESTATE..Saturday & Sunday! SENIOR SORTERS ALAMO ESTATE...Fine Rugs, Artwork & Glorious Garden! SENIOR SORTERS AMAZING COLLECTIONS IN CASTRO VALLEY..Feb 9th & 10th. SENIOR SORTERS DELIGHTFUL DANVILLE ESTATE..Fantastic First Sale of 2018! SENIOR SORTERS CHARMING OAKLAND ESTATE..Saturday Only! SENIOR SORTERS ROSSMOOR ESTATE..By Appointment Only! Beautiful Jewelry & Collectibles. SENIOR SORTERS FUN, FLIRTY & FABULOUS HAYWARD ESTATE..Friday & Saturday. SENIOR SORTERS CHARMING OAKLAND ESTATE..Starts Thursday. SENIOR SORTERS LIVERMORE TRIPLE DELIGHT...Jewelry, Coins, Tools and more! SENIOR SORTERS CASTRO VALLEY CLEAN OUT..Saturday Only. SENIOR SORTERS SUPER FUN SAN RAMON ESTATE..Featuring Extensive Jewelry Collection. SENIOR SORTERS WALNUT CREEK ESTATE..Sports Memorabilia & Fantastic Garden! SENIOR SORTERS EXCEPTIONAL DANVILLE ESTATE...Jewelry, Coin Collection, Art & More! SENIOR SORTERS OUTSTANDING ORINDA ESTATE...MCM DANISH! SENIOR SORTERS LAFAYETTE EXTRAVAGANZA..Stunning Estate. SENIOR SORTERS CHARMING BERKELEY ESTATE..Saturday Only. SENIOR SORTERS OAKLEY ESTATE.. Home of Mechanic, Audiophile & Collector of Vintage Radios. SENIOR SORTERS PETITE FRANCE LAFAYETTE ESTATE...Fun, Fabulous & Fashionable! This company has posted a total of 206 estate sales. Only the most recent 50 sales are shown.